8am. to 8pm. Monday to Friday and 9am to 5pm on weekends. I would think that every rider who has a Learner Permit and/or Licence today, at some point in the past has asked themselves that question. 1/ If you decide to ride PLEASE do it because YOU WANT TO!! Don’t do it to appease a partner because he or she has their licence and they think it would be a good idea for you to get yours. Only start your riding career if it’s something which you really want to do. 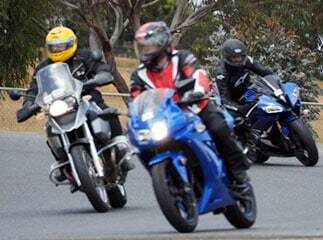 2/ If you decide to ride, you also need to make a commitment to investing in your personal safety as a rider. This investment can only be made if you’re prepared to take the time to learn to ride properly and sensibly from Day 1. 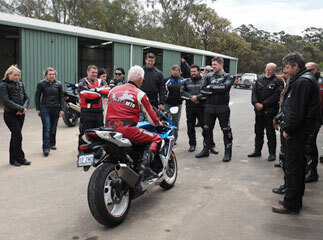 Learning to make sound decisions as a rider is a vital part of staying safe in the real world. We take this commitment very seriously as rider trainers here at Ride-Tek. 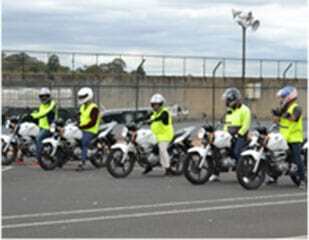 3/ Once you have gained your Learner Permit it is vital that you continue to develop your skill and safety as a rider. This can only be achieved if you purchase your first motorcycle as soon as possible after getting your Learner Permit. It’s no good taking your Permit home and sticking it on the fridge and then thinking about riding again in six months time as you will be as rusty as an old nail and will be putting yourself at greatly increased risk on the road if you ride with poor and inconsistent skills. 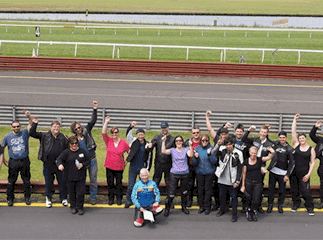 4/ The way the new mandatory Graduated Licensing System works in Victoria is based on the need for novice riders to continually develop their skills from the time that they gain their Permit as they progress through the Check Ride and Licence Assessment stages of the system. 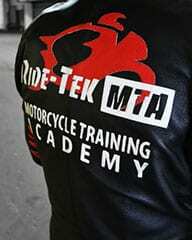 If you would like some sound advice on your decision to ride, please give Ride-Tek a call, we are here to help you. Our founder and senior instructor, Mel is now concentrating solely on our discretionary training options. 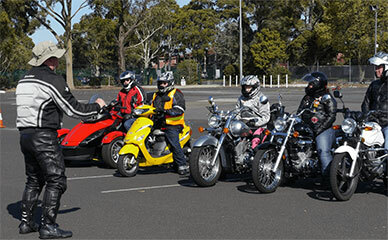 As one of Victoria’s most experienced riding instructors Mel is now available to help you with any areas of your riding. Some of the options available are Private One On One Training and Advanced Roadcraft Course which will help to enhance your practical control skills and your defensive safety skills. 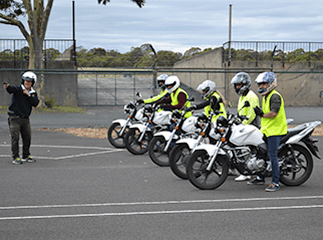 He can also help you with a “Pre-Licence” observational ride which will help you assess whether your road craft skills are sufficient to get you through your upcoming Licence Assessment. All on-road sessions are carried out with helmet intercom and a video/USB of your riding will also be provided for your reference. Summer is here and I’m sure we have all been looking forward to the peak riding season. It’s a great time to ride but there are a few things which you should consider to make the best of your summer riding time. Firstly, even though it’s warm remember ATGATT – All The Gear All The Time! You need your protective gear even in the warmer weather. Quite simply, if it’s too hot for the right gear it’s too hot for the bike, so leave it in the shed and take the car with the aircon!! PLEASE do not become a THONG-NONG, these are the people we see every summer riding around on crotch rockets in shorts and tee-shirts – OUCH!! With even a low speed spill it’s amazing how much damage you can do to yourself particularly if you’re dressed in the equivalent of your footy gear. 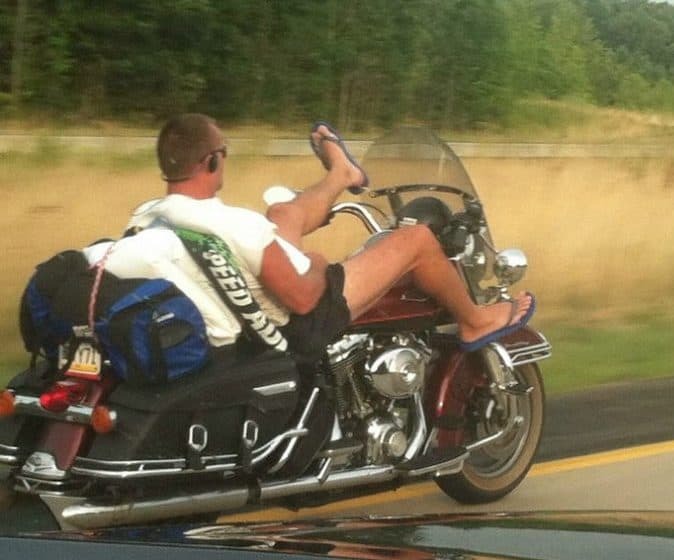 This motorcyclist probably thinks he is looking cool…. Many riders leave their bikes in the shed through most of Winter and as the weather warms up they think about throwing the leg over the seat again. It’s a good idea to get your bike serviced at the start of the season to refresh the fluids and oil, bleed the brakes and generally give the whole bike a thorough check before you head out for that summer season. Also brush up your skills with us if you’ve had a fair break from riding. 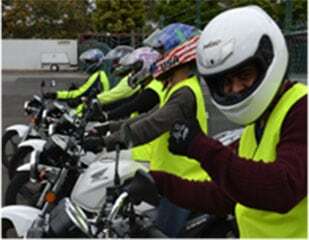 Just a couple of hours with one of our instructors either on-road or on our training range can quickly refresh and revitalise your skills to keep you safe throughout the summer peak. Finally, during the warmer weather, please remember that the warm days deplete your hydration and concentration very quickly, so when you’re riding please stop for regular breaks and keep yourselves hydrated (water preferably – NOT alcohol), and try to do any long rides with breaks every couple of hours as a maximum, as this will help to keep the concentration levels up. Whatever you ride and wherever you ride it – ENJOY IT, RIDE RESPONSIBLY AND BE SAFE.